In a previous post, we showed that General Dawgless Lee, Dudebro and Chicken’s commanding officer, would follow his brodacious soldiers through their mission as a cool-looking hologram. 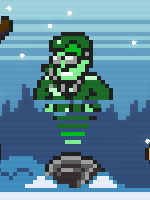 Back then, the switch to a 2D sidescroller wasn’t announced yet, so we had to settle on only showing a cutscene sprite, whose 16 bit style was already public. 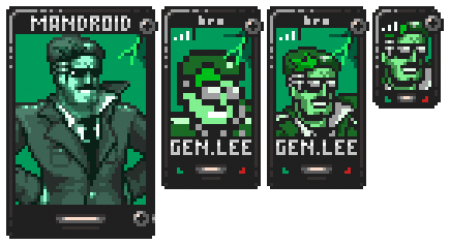 Well, a lot of time has passed since then, and on the left you can now finally see how our beloved General really looks ingame, in pure 8 bit retro style glory. Over time, though, we came to realize that holograms alone wouldn’t have been good enough. They are, by nature, static. Especially in a sidescroller, that is something you can rarely afford outside of cutscenes. If the only way to communicate with General Lee (or other characters) was through holograms, we would have been forced to keep that to a minimum so as not to interrupt the player too much. Instead, we came up with another idea: giving Dudebro a mobile phone. This would allow for some interaction with the offscreen characters, without interrupting the flow of the gameplay with cutscenes or separate “codec screens”. The phone call dialogue wouldn’t require user confirmation and just punctuate the action in specific instances without stopping it altogether. To choose a design for Dudebro’s phone, we went through multiple iterations until we found one that covered the least screen space, but still allowed for some sort of visual presence for your interlocutor. Our goal was to make this as unobtrusive as possible, so we went for the rightmost design in the picture above. And here’s the final result: a thin phone call dialogue box with a half-transparent background, located near the bottom of the screen to prevent it from covering important gameplay elements. 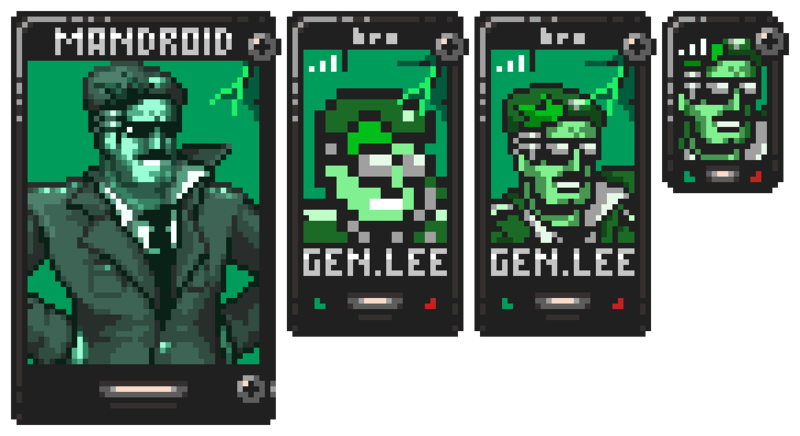 While adding another means of communication may seem redundant in theory, phone calls have already proven themselves a valuable tool in the instances where holograms just wouldn’t fit, and together with the Holo-General they have allowed for a whole new array of jokes and gags. This entry was posted on Monday, April 14th, 2014 at 4:00 pm	and is filed under Main News.